Harvest | NJNA is Blogging! As many of you know, I enjoy doing painted canvases and usually do my own stitch guides. 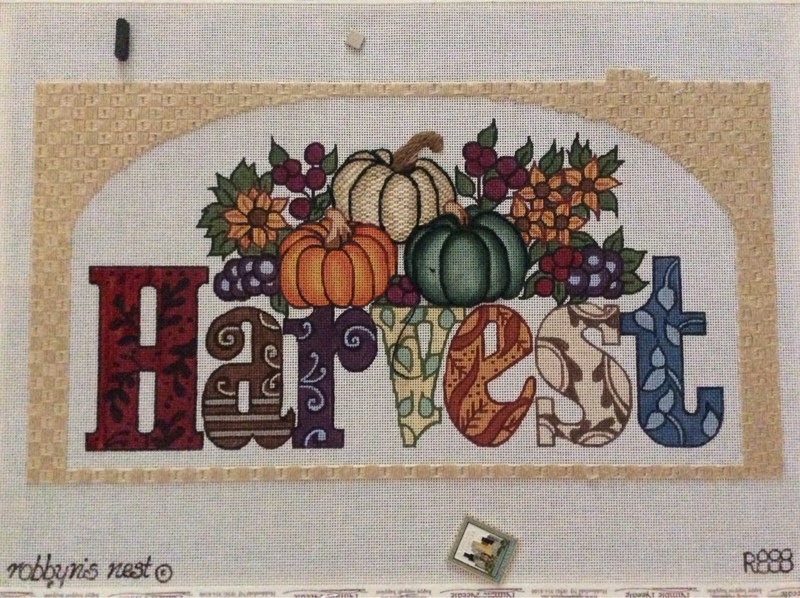 I saw an online mystery class with Sandy Arthur advertised for Harvest, a painted canvas by Robbyn’s Nest, and fell in love with the canvas. Plus, I figured it was about time to take a class with a stitch guide. I have to say, I’ve been very pleased with the first two lessons, even if, as usual, I’m way behind! The border is perfect for the canvas. Sandy suggested either a rectangle border or an arch across the top depending on how you were going to have it finished. I decided the arch fit the canvas design better than just a rectangle but wanted the rectangle for framing. I printed an oval the width I wanted and then cut it out to trace onto the canvas. It took a few tries before I got the right placement. Stitching the left side seemed to flow rather easily; the right side was a challenge since the stitches are opposite the left side. I’m not entirely happy with it but will see once I get the basket weave inside. I’ve started the H, the tan pumpkin, and the green pumpkin. I’m still playing with them a bit to get the right look! I was going to start the flowers and leaves but realized I bought the wrong thread for the leaves. It’s a ThreadWorx and they use the same numbers for all their fibers of the same color with an extra number or two at the front. I accidentally bought Perel #5 instead of floss. Anyway, here’s my progress so far. Like I said, I’m really enjoying this piece. I’m just trying to fit in all the other projects I’m doing as well ! Looks great so far! I love the arch. Think you were right to combine the arch within the rectangle. Looks great!